Ask fellow campers about "Laramie KOA" and nearby attractions. 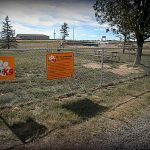 I have one thing to say to the owners of the Laramie KOA: Shut it down! I have one thing to say to you who are bringing a big RV rig to Laramie: Go Elsewhere! In a sea of marginal campgrounds, Laramie KOA sets the bar below acceptability. Oh, it's clean and neat, and it has all the requisite facilities. But there's no beauty, no life, no soul! They didn't even provide on-site management when I was there. Just a remote reservation service, and some mysterious messenger to put check-in instructions in the late check-in box. The campground is just a gravel parking lot, laid out in the regular KOA pattern of diagonal pull-through sites. But the space between sites is barely wide enough to fit a picnic table and the adjacent site's utilities. Then there's the noise! Laramie KOA is barely 50 yards from busy I-80; the road noise is constant. And they put me in the row closest to the traffic. Their map shows a "Green Belt" dividing the interstate from the campground, but that consists of a few scattered firs and a row of newly planted baby trees that might offer a sight and sound barrier in twenty years. What we have here is a typical monopoly situation. There are few campgrounds in the Laramie area, and I saw some on the way into Laramie that are far worse. Nonetheless, KOA management is exploiting the fact by charging upscale prices ($43/night) for minimal investment. They're getting by with it because customers still come, though not many to judge by the the campers here in late October. It's time to show KOA management that resort pricing requires resort quality, and that we won't stand for less. If you have to come to Laramie, don't bring your RV! Go to a motel! We camped at Laramie KOA in a Fifth Wheel. Sites are so close together that when your neighbor's slide is out there is just enough to room to sneak between rigs. Our spot 108 backed up to I-80's exit ramp so we endured Jake brake noise all night. Noise fence perhaps? Wi-fi was totally unusable our entire stay. While I appreciate the office staff's honesty, their response was pathetic. "When the park is full the Wi-fi doesn't work". Apparently ditto for the 50A service, which dipped to 110 volts on occasion. Gravel road to gravel site. Grossly overpriced for our stay. We will not return. We camped at Laramie KOA in a Motorhome. Packed in like sardines. Had to make sure to not step on our neighbor's sewer when leaving our camper. Large poles surrounding their WiFi antenna actually in our site. Could not use the picnic table at all due to the layout of the site. Laundry cost was $1/machine higher than the ones we've used before. Dryers cost $2.50/hr - couldn't adjust for shorter time as is common. No dispensers to purchase laundry supplies and no change machine. Might be open 24/7, but make sure you don't need help if office is closed. Sad. 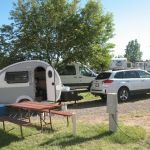 We camped at Laramie KOA in a Fifth Wheel. This park was one of the worst we have ever seen. It was so jammed with RVs and our RV wouldn't fit in the space we were directed to, so, they gave us another space. Price was outrageous for what we put up with. Spaces so tight you couldn't hardly move and no sitting outside at all. This was just one reason we rarely use KOA campgrounds anymore, they try and get as many RV's in to get more revenue. Horrible and expensive experience. Never again. We camped at Laramie KOA in a Travel Trailer. Really don't agree with all the comments about road noise. It was similar to many other parks and did not bother us. Site was level and adequate. Only complaint, which may seem minor if you are not about age 80 with arthritis in your fingers, the cable tv connection is 12 inches off the ground (site 77) next to a cable pipe and the only way I could connect was to lay prone on the grass and take off my rx glasses and try to screw cable onto connection. We camped at Laramie KOA in a Motorhome. If you like to sit outside your camper, do NOT stay at this park unless you get one of the end spots. SUPER tight between sites. Water and electric worked fine, didn't use anything else. Office staff was friendly and knowledgeable. We camped at Laramie KOA in a Fifth Wheel. Lady gave us a site that was 5 feet too short so I had to go back to office. Next site was long enough but was so tight that my slideout was up against the next site's picnic table. Neighbor was sitting at his table smoking a cigar and it smelled like it was in our TT. Our table was over our neighbors' sewer hose. Site had puddles of water standing from an earlier rainstorm. Cable TV didn't work so I went back to office (again) and was told that some sites didn't work. She didn't tell us that when we checked in. We did not hear the train horns from nearby tracks because the I-80 traffic noise drowned them out all night!!!! You are right next to the interstate so be prepared. We did not get much sleep because of the semis noise. We won't go back. We camped at Laramie KOA in a Travel Trailer. 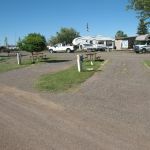 Located behind a large Pilot station, next to an interstate highway and in the middle of a mobile home park, we stayed at this KOA Park four 4 nights without regret. Entrance to the office is asphalt with no speed bumps but beware of the rain water channels necessary for this part of the world. The connecting roads and pads are gravel, smooth and flat. The parking pads are all pull-thru but the grassy space between sites is narrow. The neighbor's slide out extends over the seats of my picnic table. The office staff and ground crew are friendly and helpful. The office is well stocked and the campground is location 3 minutes from town. The WIFI is good but spotty at peak hours. The showers were clean and well maintained. Laundry has a good number of new washers and dryers. Nice play ground but I didn't see a pool. Ample areas to walk the dogs and there are a number dumpers around the parks for garbage. The park is well maintained and neat. We camped at Laramie KOA in a Travel Trailer. At first, we were put in the row closest to the highway. All night long there was loud traffic, trucks using their jake brakes, etc. We didn't sleep a wink. They were kind enough to move us to the fourth row from the highway. The park was pretty full so there were a lot of rigs between us and the traffic so it was nice and quiet. The sites are gravel with some grass and trees and pretty level. The staff were beyond friendly, nice and accommodating. Special thanks to Cat for moving us! The laundry room was just OK, water leaks, etc., and pricey. $2.50 for a wash and $2.50 for a dry. Overall a nice park. Don't let them put you in the row near the freeway unless it's just an overnight and you can take the traffic racket! We camped at Laramie KOA in a Motorhome. We were here for Jubilee Days. Lots to see and do: rodeos, parade, carnival, etc. Also, less than 20 mi. away, there are 2 monuments: Ames Monument and Lincoln Monument. Both are quite impressive! Sites unsatisfactorily close for big rigs with slideouts. I-80 high level noise irritating. Some sites have egress impeded by vehicles for row in front parking partially in street. On the plus side the pull thru sites are long enough to accommodate a big rig motorhome and towed. And, the sites are reasonably level. We camped at Laramie KOA in a Motorhome. Sites were VERY close together. If someone had been next to us with slides, we would have had to duck under to get to picnic table. Right next to I-80, and I mean no more than 150-200'. Noise was horrible at all hours of the day and night. Just a gravel parking lot with hookups. Definitely NOT worth the price. It was easy on/off the highway, but that didn't offset the other negatives. Look for someplace else. We camped at Laramie KOA in a Motorhome. We stayed here for one week while my husband attended a conference at the local university. 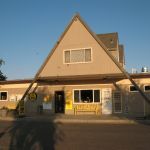 The KOA is perfectly located for a stay in Laramie. As KOA's go it is a midrange one. There is no pool but there is a very nice playground and the fenced dog park is big enough for my big dogs to cut loose and run. Showers were clean and had abundant hot, WIFI was recently upgraded and it was great. Cable had quite a few channels. We were there in winter which meant no running water at the sites and we had a discount due to that. Staff were pleasant and friendly. One big negative was that the staff work limited hours in winter and are not there on Sunday. It was not a problem for us but people coming in Saturday night were stuck for things like the bathroom code and WIFI. It is right near the interstate and a main trucking route so there was a lot of truck noise. We camped at Laramie KOA in a Travel Trailer. 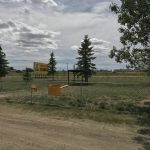 If you have sociable dogs, there is a really great off leash dog park a short drive away at the Optimist Park near Garfield Rd and Snowy Range Rd. We went twice a day during our stay. Due to extremely high winds we were forced off of Interstate 80 and were able to get into the Laramie KOA. What a relief it was to get off the road in 60+MPH winds. We were fortunate to just arrive in time (late morning) to checkin as the office person was on his way out the door for more than a few hours. This seemed odd but this is how they do it in the off season. Getting to the KOA and to the site was no problem. The KOA is a stones throw to the Interstate. I called this an average campground as it appears to be an older KOA with a tired look. The roads and sites were pretty much the same...gravel with more dirt than gravel. Our site was a pull through and we did not have to unhook. Site was very narrow, but level and outside was not very appealing, but we didn't care when the wind was blowing this hard. All hookups worked well including WIFI and cable. Being so close to the interstate made for plenty of road noise but this had to compete with the wind noise. Overall we were happy to be inside a cozy trailer and off the road. We would return if passing through and under similiar conditions, otherwise we probably would keep on going. 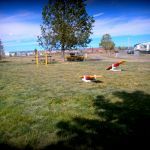 We camped at Laramie KOA in a Travel Trailer. Water was shut off for the season, so I presume price reflects winter rate. OK. Just OK, nothing special, nothing terrible. Gravel lot with hookups within sight (and sound) of the freeway. Best signage for finding the place I've ever seen. We camped at Laramie KOA in a Motorhome. Right on highway and very noisy . The spaces are very very close and sewer for each site is way toooo close. This place is way too pricey, keep Driving. We won't stop Here again! We camped at Laramie KOA in a Fifth Wheel. Drive the Snowy Range. Beautiful scenery. Walmart is out of town towards Cheyenne on Rt 30. Right on the edge of Laramie. The Altitude Chophouse in town is fantastic. Sort of upscale but excellent service and food. The NU2U thrift store on 5th street is loaded with designer stuff from the University students at VERY low prices. Riding through town makes one think of stage coaches, horses and gun fights. Loved Laramie. The Territorial prison is a must see and the UW campus has a number of museums. Be sure to go see the Territorial Prison and the Ivinson museum. 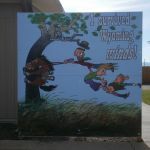 Are you affiliated with Laramie KOA ?